Illinois families have undoubtably 'felt' this effect, but now Michael Lucci at the Illinois Policy Institute is out with their latest that shows what under a total Democrat-controlled government here in Illinois. Illinoisans enjoyed a larger paycheck than their Iowa counterparts for 30 years – until 2012. 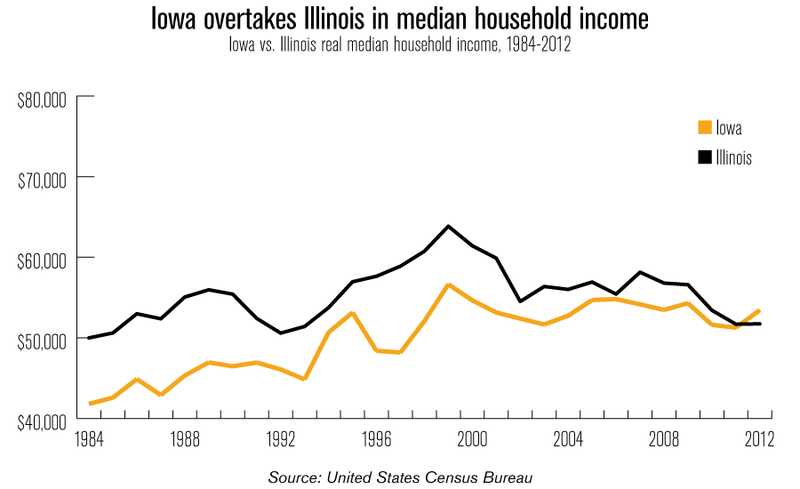 That year, for the first time ever, the median household in Iowa surpassed its Illinois counterpart. The middle income in Illinois has collapsed by $12,000 in the last 15 years, indicating that the state is hollowing out its middle class. These shrinking paychecks have been driven by a number of factors, including state policies that smother entrepreneurs, a regulatory environment that strangles businesses, Illinois’ culture of cronyism and overall high taxation. In addition, Illinois’ out-migration crisis is magnitudes greater than Iowa’s, as Iowa has turned the corner and is stemming its annual loss of residents to other states. Illinois, on the other hand, leads the Midwest in exporting talent, accounting for a net loss of 50,000 Illinoisans and $2 billion worth of income in 2010 alone. The average Illinoisan who leaves the state makes about $8,700 more than the average person who enters into the state, and about $9,300 more than the state median income, causing the state’s middle income to slip lower and lower. As recently as 1990, Illinois had the highest median household income of the 12 states in the Midwest. Now Illinoisans have fallen to sixth, with Iowa, Minnesota, Nebraska, North Dakota and Wisconsin moving ahead. Illinois’ tax-and-spend policies, cronyism and dystopian regulation do not serve the middle class. Regardless of the football outcomes, we here in Illinois could always hold our head's high in knowing that we were just a bit *better* than those Hawkeyes. Unfortunately...it looks like we've lost that battle, too.